Winter is officially here and that means it’s time for winter tires. It might seem like a great expense—if the tires on my car weren’t made for all seasons, why do they call them all season tires?—but trust us, they’re worth it. Really. Not sure which kind is best? Here’s what you need to know before buying some. Booming sales of crossovers and Subarus of all kinds are strong evidence of how many drivers on the road these days that seem to think that all- or four-wheel drive will save them on snow and ice. They go buy an all-wheel drive SUV, slap on a set of all-season tires and go about their merry way. 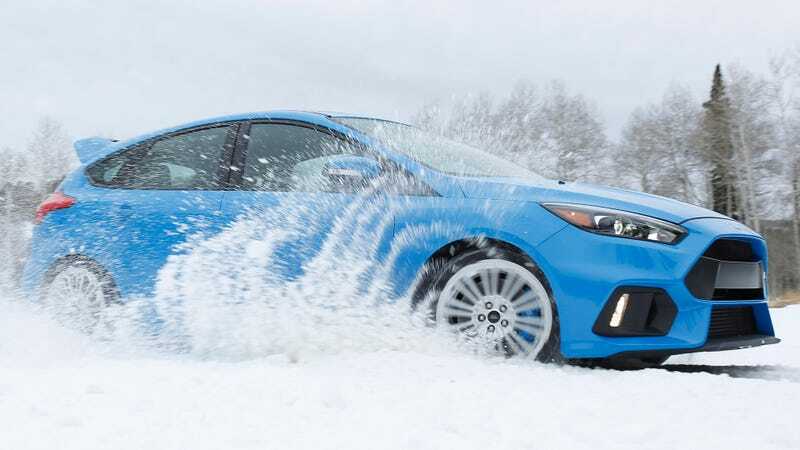 Winter tires will have an optimized tread pattern for low-traction situations. They also must have a sufficient tread depth to clear through slush or snow. (That’s a “volumetric driving event” in tire-speak.) Lastly, a winter tire’s compound (which you cannot see) is designed at a molecular level to stay soft, malleable and grippy as temperatures drop. Rogers used a candy bar as an example. At room temperature, a candy bar is just right. Delicious, even. But if you put it in the freezer for a bit, it becomes rock-hard, brittle and breakable. The same happens to tire compounds that were not designed for cold temperatures: the traction and grippiness deceases dramatically. You also might have heard that you only need two winter tires, usually a set for the car’s driving wheels. Margadonna immediately debunked that, asserting that you should always put winter tires at all four corners in order to maximize handling, even if you don’t have all- and four-wheel drive. If you lose all the traction on your back wheels, like you do intentionally for skidplate racing, your car starts driving like it’s on roller skates. So! How do you decide which winter shoes to buy? Studded Or Performance Winter Tires? Studded tires are an option in the winter. These are winter tires that have metal studs embedded within the tread, and they physically dig into ice and give better traction than anything else. The problem is that just as these studs dig into ice, they would dig into pavement, too, and actually damage road surfaces. That’s why some states only allow the during certain months of the year and others ban them altogether. Check with your state to see if and when studded tires are allowed. Winter tires are legal everywhere, so that’s what we’ll focus on here. There are two types of winter tires available: studless and performance. Before you start shopping, you should figure out which best fit your needs. What are your driving priorities? 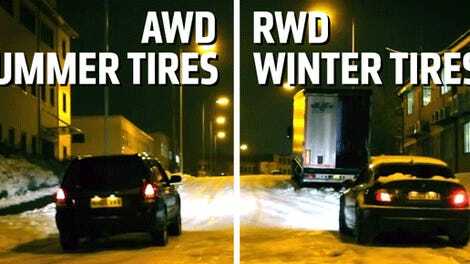 If you’re someone who needs to drive every single day and it is imperative that you be at work, snow or no snow, then you’re probably better off with a studless winter tire, the more aggressive of the two. If you tend to drive when the roads are cold as hell but more or less clear and dry, then a performance winter tire is most likely best. Studless tires are best for when winter is at its worst. These tires have maximum snow and ice traction and are made from a special type of winter compound that provides traction on whatever the texture of the road surface might be. They are designed to grip both the snow and the thin layer of water that usually accumulates in the tire’s footprint. The colder it gets, the better they work relative to performance winters or all-seasons. Their compromise is that in milder weather, they’re not your best choice. Performance winter tires are still designed to be used in icy and cold conditions, but they are ideal for clear roads and warmer days. They’re better in the wet and dry, plus they feel better to drive on. Moreover, they have a higher speed rating than their more extreme studless cousins. Performance winter tires won’t have the same bite as studless tires do in the snow, but if, say, you live in a city and don’t drive huge distances every day and still want a nice winter tire in case you get caught in a snow storm, then performance winters are probably your best option. The symbol is branded on tires that pass a standardized traction test. It used to be that only winter tires had this symbol, but now some all-seasons have them as well. Keep that in mind when tire shopping. Just because an all-season tire is branded, it still won’t perform as well as a branded winter tire in low-traction conditions. The M+S symbol means that the tire was also designed to perform well in moderate winter conditions. If you’re buying a new set of wheels and tires, you should check what your car was originally offered with from the factory to make sure you keep things consistent. Using the same tire size as the OEM is typically the best choice. You don’t always have to do that, though. For example, if you have 18-inch wheels on your car, but the base model came with 17-inch wheels, you can definitely minus-size your wheels and tires because the car came from the factory designed to utilize the smaller size. You’d probably save some money that way, which is nice. To determine what size tires to buy for your car, consult the placard in the door jam, usually located on the driver’s side. One thing to keep in mind here is that you should keep the overall diameter of the wheel and tire together consistent with what the car first came with. Various aspects of the car are calibrated based on this diameter (traction control, speedometer, etc. ), so messing with that without first properly doing research can be harmful. Luckily, companies like Tire Rack have databases filled with different wheel and tires sizes from all kinds of different cars. Now, you can go onto the website, specify what kind of tire you are looking for, enter the make and model of your car and see what options have been tested to fit what you need. Usually, the recommended tire pressure in PSI for winter tires is the same as for other tires. That handy little placard in the door jam will also tell you the advised tire pressure for your tires, but you can also consult your owner’s manual as well. Sometimes, your manual will recommend you to go with a slightly higher tire pressure, as this can help with the handling and fight off fluctuations in air pressure. Rogers explained that for every drop in 10 degrees in air temperature, the tires drop one PSI. On top of that, tires on average will lose one PSI for every month you drive your car. So, if you put your snow tires on your car on November when it was 50 degrees outside, a 10 degree day in January means that you’ve already lost about six PSI in your tires. In a perfect world, we’d have a tire that would be grippy and sticky in the summer, great in the wet and an absolute monster in the snow and ice. As is the nature of things, you can’t have it all, which is why all-season aren’t particularly good at either thing. 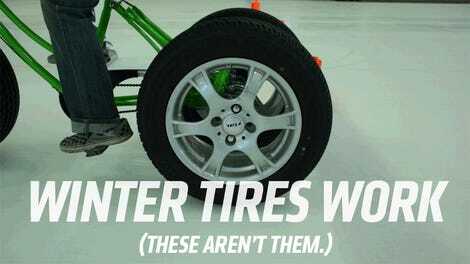 Winter tires, though incredible in the snow and ice, admittedly aren’t as good in cold and dry braking conditions. In the dry, the all-seasons are as good or better. But! The reckoning comes with the wet conditions. That’s the trade off for top-tier snow and ice traction. “The best winter tires do a good job at managing that trade off,” Rogers adds. OK, But What Tires Specifically Do You Recommend? Rogers’ personal go-tos for studless tires are the Bridgestone Blizzak WS80s, though the Michelin Xi3s are a close second. They’re not quite as good on snow and ice, but they’re better in the wet and dry. For performance winters, he recommends the Pirelli Sottozero 3s and the Michelin Pilot Alpin PA4s. Keep an eye out for the shops that will offer to modify a tire’s tread pattern and claim to increase its snow traction. Steve Carpino, Pirelli’s senior consultant of product design and development, warns that these alterations should not be done to any tires, ever. Tires have been designed by their manufacturer to perform the best from the factory. Tractionizing a tire for ice is a real thing, but it basically entails chopping up your tire. It has severe tradeoffs, like how long the tire lasts (or doesn’t.) If you’re going flat out on a rally stage or a frozen ice race, great. If you’re just driving around, your tire is going to die. I get why people don’t always buy winter tires. It takes time and money to buy them in the first place and get them mounted each winter. Plus you have to store them when you aren’t using them. (This does does help increase the longevity of your other set of fair weather tires, it should be noted.) All in all, it’s not terribly convenient. But what you get back is peace of mind and safety. I just returned from driving an all-wheel drive Volvo on a set of all-seasons in the snow last weekend. It was fine in a straight line, but when any kind of sudden braking or turning happened, the car shuddered or just swung its tail out. Not good. That kind of thing makes you feel nervous and timid whenever it snows. Of course, you should always be cautious when driving in adverse conditions, but the security that comes with having a good set of winter tires helps you free up some of your mind so you can drive even more safely. The difference in feel is something that you have to experience to believe, and you’ll kick yourself for not buying them sooner once you get your first set. As with everything else you do for your car, you should research, research, research beforehand. Research the best tire, read reviews and look up tests. Certain OEMs have tire recommendations of their own, especially if they are like Porsche or Mercedes and offer high-performance models. I won’t BS you: It takes time, but it’ll be worth it. Why Do Opossums Love Trash?